Royal Suite on Avalon Creativity. Photo courtesy of Avalon Waterways. How do stateroom sizes compare for ships that travel on the Seine River? Most river cruise companies have at least one vessel on this waterway, so there’s a good representation across the industry. To get an overall picture of how the accommodations compare, stateroom size ranges from a mere 86 square feet all the way up to 455 square feet. Viking River Cruises and CroisiEurope are the only two companies that have more than one ship on the Seine. So in the table below, the other companies do not have a range in stateroom size for any of the categories. List of all river cruise companies and their stateroom size ranges for single staterooms, smallest double staterooms, largest staterooms and most common staterooms on the Seine River. Single staterooms are not available on most ships that cruise on the Seine River. CroisiEurope features single staterooms on some of its ships, and Tauck offers single accommodations on the ms Swiss Sapphire. Single stateroom size for Tauck measures 150 square feet, and single staterooms are between 94 square feet and 140 square feet for CroisiEurope. For the smallest double stateroom category, cabins range from 118 square feet to 172 square feet in size. AmaWaterways and Avalon Waterways‘ smallest double staterooms measure 170 square feet and 172 square feet, respectively. CroisiEurope has the smallest double stateroom, measuring 118 square feet, while its standard double staterooms measures 140 square feet. Viking River Cruises‘ smallest cabins that are measure between 120 square feet and 135 square feet. Both Tauck and Uniworld‘s smallest double staterooms measure at 150 square feet. And Scenic features staterooms that are only slightly larger. Its smallest double cabins are 160 square feet. Not surprisingly, there’s a more substantial variation with the largest double staterooms, which range from 112 square feet to 455 square feet. CroisiEurope has the smallest staterooms in this category. They’re between 112 square feet and 182 square feet. Viking River Cruises has a large variation. On some of its older ships, the largest staterooms are only 170 square feet. But its newer ships are built with much more spacious accommodations, which occupy up to 445 square feet. 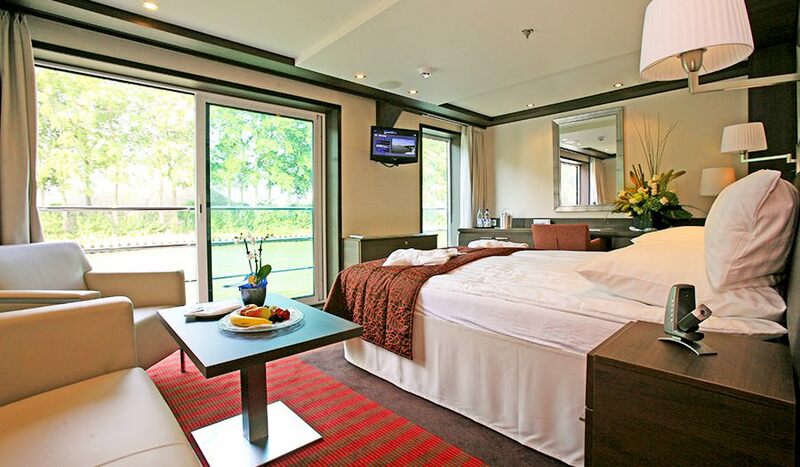 Uniworld’s largest staterooms on the River Baroness are 215 square feet. The AmaLegro has cabins up to 255 square feet, and the suites on the Avalon Creativity are 258 square feet. The suites on the ms Swiss Sapphire measure 300 square feet. The Scenic Gem has the largest staterooms in this category at 455 square feet, which is comparable in size to Viking’s newer ships on the Seine River. The most common stateroom size for ships on the Seine River is between 86 square feet and 205 square feet. CroisiEurope has the smallest, and Avalon Waterways, Scenic and Viking River Cruises have the largest in this category. Overall, the average hovers around 170 square feet. Which Company Has the Largest Staterooms? By comparison in all categories, Scenic has the largest staterooms available for Seine River cruises. The smallest cabins are 160 square feet, the largest are 455 square feet and the most common are 205 square feet. Unlike some of the other comparisons made for ships on other rivers, the Scenic Gem is dominant in all three categories. Second place would probably go to Viking River Cruises, but only to its newer ships. See other articles in this series of stateroom size comparisons: AmaWaterways, A-ROSA, Avalon Waterways, CroisiEurope, Emerald Waterways, Scenic, Tauck, Uniworld and Viking River Cruises.